More with Music: To pick or not to pick? To pick or not to pick...that is the question. In the world of Music Therapy, a lot of therapists use their guitars daily. It's such a portable instrument with the type of acoustic sound that you can incorporate within a variety of settings. 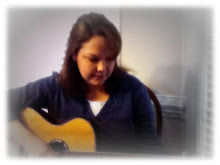 Children and adults both enjoy listening to guitar and are often fascinated with the mechanics of producing its sound. I have always wondered about using picks to play guitar. I play an acoustic-electric guitar and also play a few things on a classical guitar. In the history of my guitar playing (which actually hasn't been as long as you think), I've never been required to use a pick and neither of my college guitar teachers used a pick or instructed us in the use of guitar pick. (Remember, I only play classical and acoustic-electric, so I think a pick might have been introduced at some point if I had been playing an electric bass guitar or something like that). So, in my wonderings about guitar picks, I looked up some info about it. Traditionally, people do not use guitar picks when playing classical guitars. They are played with fingers only. 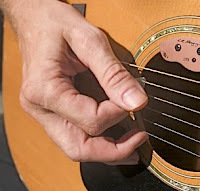 Nylon strings are prone to break more easily when played with a pick. Acoustics usually come with a pick guard in a tear drop shape, to help protect the wood from wear and tear from the pick. (I always wondered what that was for...other than for looks!) Some people play acoustic-electric guitars with the use of a guitar pick. Others play with their fingers. I don't use a pick. However, I'm not sure why...I'm just comfortable the way I play. I do know that using a pick definitely projects your overall sound when you strum a guitar. In most of the settings I currently serve, I don't think I want my guitar to sound any louder when I strum. I think that that could possibly be overwhelming for some of the students I serve and definitely affect the nonthreatening medium we, as music therapists, try to reflect in our work. How about you? Do you use a pick for certain settings and/or pieces of music? Do you choose to play with your fingers only? Good topic, Amanda! I'm with you: I've always felt much more comfortable using my fingers as opposed to a pick. It's also easier that way when working with children, since we're constantly picking up and putting back down our guitars to use our hands otherwise. However, I teach my guitar students both methods of playing so that they can choose for themselves which they prefer. As a person whose main instrument was classical guitar in college, I am absolutely clueless when it comes to using a pick. In fact, when I bought my acoustic guitar a couple of years ago, it was a problem, because it tears my guitar picking nails to shreds! Ack!